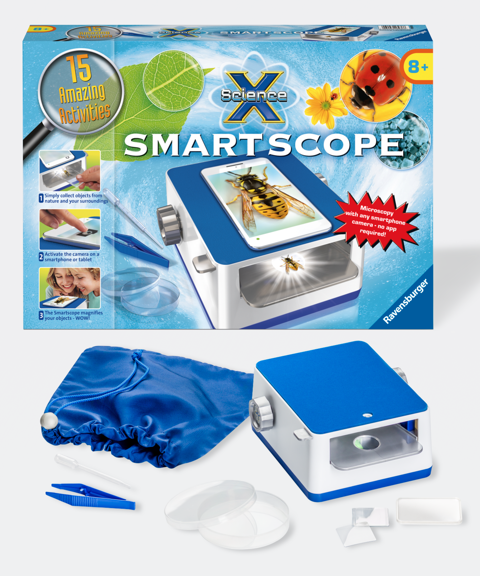 SmartScope from Ravensburger is a great gift suggestion this Spring! You are here: Home / Featured Products of the Week / SmartScope from Ravensburger is a great gift suggestion this Spring! Looking for a fun gift idea for older kids this Easter or Spring Break? Use your smart phone or tablet to explore the amazing world of microscopics with Smartscope! Magnify your own finds, including water, sand, feathers, leaves, insects, and more, or study the objects on the included poster and follow along in the manual for fun facts about each. With a removable light source, sliding object tray and two levels of magnification, you’ll be able to scope out all kinds of objects in minute detail and email them to all your friends! I received this one and this one is educational and fun! Science X SmartScope has 15 activities and is really easy to use! I like that there is no app required and you simply activate the camera on a smartphone or tablet. This will be so much fun to use this upcoming Spring! I like to go on nature hikes and collect different objects from nature. This one is a must-buy and recommended for ages 8+. Retails for $44.99. Self Disclosure: I received a free product to facilitate this Spring time post. No other compensation was received.